Distribuidora Internacional de Alimentación, S.A. and its subsidiaries form the DIA Group. 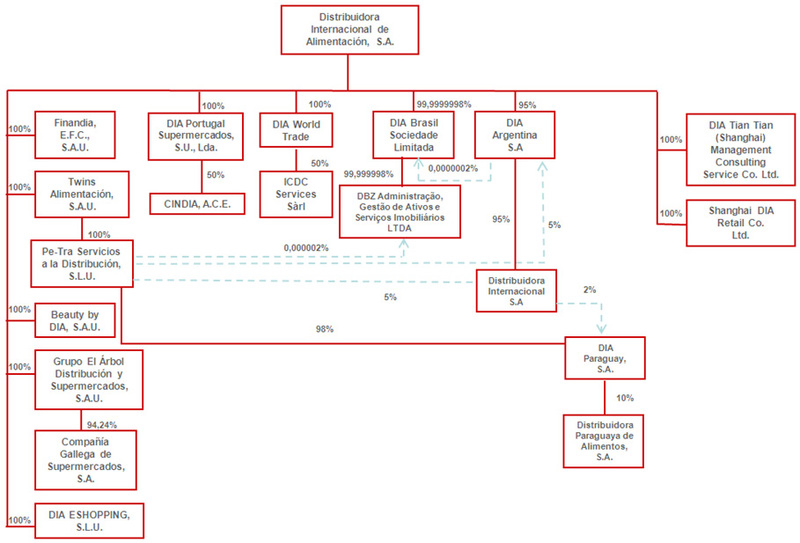 Distribuidora Internacional de Alimentación, S.A. owns, directly or indirectly, 100% of all its subsidiaries, except for Compañía Gallega de Supermercados, S.A. of which it owns 94.24%, and ICDC Services Sarl, of which it owns 50%. It also owns 50% of CINDIA, A.C.E. and 10% of Distribuidora Paraguaya de Alimentos, S.A. The DIA Group’s main activity is the retail and wholesale sale of food products and other consumer products, through owned or franchised stores. DIA World Trade, S.A. is located in Geneva, Switzerland, and provides services to the suppliers of the DIA Group companies. Finandia E.F.C., S.A.U. is a Spanish credit company that offers financing to customers of the DIA stores in Spain with the “ClubDIA” card. Distribuidora Internacional, S.A., located in Buenos Aires, Argentina, is specialised in services consultancy. The group of companies CINDIA, A.C.E and the ICDC company have been set up together with Intermarché and Casino, respectively, to jointly purchase goods in Portugal and Switzerland (Geneva). DIA E-Shopping creates, maintains and operates websites and internet portals for the sale of products and services. The company DBZ Administraçao, Gestao de ativos e Serviços Imobiliarios Ltda., domiciled in Sao Paulo, is involved in managing the real estate belonging to DIA Brasil. Distribuidora Internacional de Alimentación, S.A. is managed and governed by a Board of Directors made up of ten members, of which eight are independent, one is executive, and one is classified as “other external director”. Ana María Llopis Rivas: Non-executive Chairwoman classified as “other external director”. Mariano Martín Mampaso: Vice-Chairman qualified as independent. Ricardo Currás de Don Pablos: CEO qualified as executive. Julián Díaz González: Director qualified as independent. Richard Golding: Director qualified as independent. Antonio Urcelay Alonso: Director qualified as independent. Juan María Nin Génova: Director qualified as independent. Ángela Spindler: Director qualified as independent. Borja de la Cierva Álvarez de Sotomayor: Director qualified as independent. María Garaña: Director qualified as independent. On 22 April 2016 and 7 September 2016 respectively, Pierre Cuilleret and Rosalía Portela de Pablo ceased to be Board Members. Ángela Spindler joined the Board of Directors on 22 April 2016 (co-opted appointment on 15 February 2016, and ratified in the AGM on 22 April 2016). Borja de la Cierva Álvarez de Sotomayor and María Garaña Corces joined the Board of Directors on 5 September 2016 and 14 December 2016 respectively. On these dates, they were appointed by co-optation, and these appointments will be submitted for approval at the next Junta General Shareholders Meeting of Distribuidora Internacional de Alimentación, S.A. The overall function of the Board of Directors is the supervision and consideration of matters of particular importance to the Group. As a general rule, it entrusts the Group’s ordinary management to the CEO and Senior Management (see point 1.1.3). The strategic or business plan, as well as the management targets and the annual budget. The investment and financing policy. The determination of the Company’s fiscal strategy. The definition of structure of the corporate group, and the coordination, within the legal limits, of the group’s general strategy in the interest of the Company and the companies comprising it. The corporate governance policy of the Company and its group. The corporate social responsibility policy. The supervision of the performance of the board committees set up within it, as well as the acts carried out by delegated bodies and the designated directors. The policy for compensation and evaluation of the management team’s performance. The policy for control and management of risk, including fiscal risks, and the supervision of information and control systems, identifying the Company’s main risks and organising the appropriate internal control and reporting systems. Defining the basis for the corporate organisation, in order to ensure greater efficiency thereof and the effective supervision by the board of directors. Setting and implementing the dividend and treasury share policies, within the framework of the authorisations of the general meeting. Convening the general shareholders meeting and drafting the agenda and proposals for resolutions. Appointing directors by way of co-option and referring proposals to the general meeting regarding the appointment, ratification, re-election or removal of directors, as well as the acceptance of director resignations. Appointing and renewing internal positions on the board of directors, and the members and positions of the committees constituted within the board. Delegating authority to any of its members, under the terms established by law and the articles of association, and revocation thereof. Appointing and removing executive directors and senior managers reporting directly to the board, as well as establishing the basic conditions of their contracts, including their remuneration. Granting an authorisation or exemption of the obligations deriving from the duty of loyalty, when the granting of such authorisation lies legally with the board, in accordance with legal stipulations. Preparing the financial statements, management report and proposal for the application of the Company’s profits, as well as the consolidated financial statements and the management report, and their submission to the general meeting for approval. Approving the financial information that the Company, being a listed company, must periodically disclose. Preparing the annual governance report and the annual report on directors’ remuneration, both to be presented to the general meeting and the other reports and documents that must be submitted to it. Approving and amending this regulation. Proposing to the Company’s general shareholders meeting the amendments to the regulation of the general shareholders meeting that it deems appropriate to ensure the exercise of shareholders’ rights of participation. Decisions relating to the remuneration of board members, in accordance with the articles of association and, if applicable, the remuneration policy approved by the general meeting. Fixing, in the case of executive directors, any additional remuneration for their management duties and other terms of their contracts. Establishing strategic alliances with industrial, commercial or financial groups, domestic or foreign. Investments, divestitures or transactions of all kinds (including financial transactions) that, due to their high amount or special characteristics, are of a strategic nature or special tax risk, including industrial, commercial and financial transactions of particular importance, unless (i) they have been approved in the annual budget, or (ii) approval thereof corresponds to the general meeting. Creating or acquiring shares in special-purpose vehicles or entities resident in jurisdictions considered to be tax havens, and any other transactions or operations of a comparable nature, which, due to their complexity, could impair the transparency of the Company and its group, after a report from the audit and compliance committee. Where the amount of the transaction does not exceed one percent (1%) of the Company’s annual revenues. The Board of Directors has appointed an audit and compliance committee, and a nominating and compensation committee. Report to the general shareholders meeting in relation to issues within the scope of its responsibilities. Supervise and review the preparation process and presentation of the required financial information which, in accordance with article 35 of the Securities Market Act, is to be provided by the board to the markets and their supervisory bodies, and, in general, ensure compliance with the legal requirements in this area, the appropriate delimitation of the scope of consolidation and the proper application of generally accepted accounting principles, as well as report on proposals for changes in accounting principles and standards suggested by management. Periodically supervise and review the effectiveness of the Company’s internal control and financial and non-financial risk management systems, including fiscal risks, verifying the appropriateness and completeness thereof; proposing the selection, appointment, re-election and removal of the responsible parties; proposing the budget for such services, approving the orientation and working plans, ensuring that the activity is focused mainly on risks relevant to the Company, and verifying that the members of the management team take into account the conclusions and recommendations in its reports; and discussing with the Company’s auditors any significant weaknesses that may be discovered in the auditing process. Coordinate the process for the reporting of non-financial and diversity information, in accordance with applicable regulation and international reference standards. Ensure the independence of the unit that undertakes the internal audit; propose the selection, appointment, re-election and dismissal of the person for the internal audit service; propose the budget for this service; approve the orientation and its working plans, ensuring that its activity is focused mainly on risks relevant to the company; receive periodical information about its activities; and verify that senior management takes into account the conclusions and recommendation in its reports. Submit to the board of directors proposals for the selection, appointment, re-election and replacement of the external account auditors, as well as their hiring conditions and regularly gather information from them about the auditing plan and its execution, preserving the independence in the exercise of their duties. Make a request to the judge for the revocation of the auditor or auditors or the auditing company or auditing companies designated by the General Meeting or by the Company Register and the appointment of another or others, when there is a just cause. Establish the appropriate relationships with the external account auditors to receive information regarding questions that may compromise their independence, for examination by the committee, and those of anyone else involved in the process of auditing accounts, and any other communications that may be contemplated in the legislation regarding auditing and audit standards. In any event, they must receive from the external auditors an annual declaration of their independence of the entity or entities directly or indirectly related to this one, and information on additional services of any kind provided to these entities and the corresponding fees received by the aforesaid external auditors, or by persons or entities related thereto, in accordance with the provisions of the legislation governing the auditing of accounts. In the event of the resignation of the external auditor, the committee shall examine the circumstances leading to this resignation. It shall ensure that the Company communicates the change of auditor as a relevant fact to the CNMV and accompanies this notification with a declaration regarding the possible existence of disagreement with the outgoing auditor and, if any, the content of such disagreement. Annually, prior to the issuing of the audit report, publish a report stating an opinion regarding the independence of the auditors. This report must comprise, in any event, the assessment of the provision of additional services referred to in the point above, individually and globally considered, different from the legal audit and in relation to the independence system or the legal provisions on auditing. Serve as a communications channel between the board of directors and the auditors; evaluate the results of each audit and the responses of the management team to its recommendations and mediate in the event of disputes between the former and the latter in relation to the principles and criteria applicable in the preparation of the Financial statements, and examine the circumstances, if any, behind the resignation of the auditor. The committee shall ensure that the external auditor holds a meeting annually with the entire board of directors to inform it of the work carried out and the evolution of the accounting situation and the risks the company faces. Supervise the compliance with the rules regarding related party transactions with directors or major shareholders or shareholders represented on the board; in particular, it will report to the board regarding such related party transactions and, in general, regarding transactions that imply or may imply conflicts of interest, for purposes of their approval, and will see to it that information in respect thereof is communicated to the market as required by law. Supervise compliance with internal codes of conduct, in particular the code of conduct for the securities market. Review the corporate social responsibility policy, ensuring that it is focused on creating value and monitoring the strategy and practices of corporate social responsibility and evaluating the degree of fulfilment. Supervise the communication strategy and relations with shareholders, investors (including small and medium shareholders) and other stakeholders. Establish an internal mechanism whereby staff can report, confidentially and, if deemed appropriate, anonymously, any irregularities they detect in the course of their duties, in particular financial or accounting irregularities, with potentially serious implications for the Company. Prepare and update a declaration of ethical values related to the reliability of financial information in compliance with applicable regulations, which will be approved by the board of directors and communicated to all levels within the organization. Establish procedures to ensure that the principles of professional integrity and ethics are respected, as well as measures to identify and correct departures from those values within the organization. Any others that may be attributed to it by law and other regulations applicable to the Company. The member of the audit and compliance Committee are Richard Golding, chairperson, and Julián Díaz González, Juan María Nin Génova, Borja de la Cierva Álvarez de Sotomayor and María Garaña Corces as members. Evaluate the competence, knowledge, and experience required on the board. To this end, the committee will determine the functions and skills required for candidates to cover a vacancy, and will evaluate the precise time and dedication in order to carry out their tasks effectively. Make proposals to the board of directors of independent directors to be appointed by co-option or for submission to decision by the general meeting, and proposals for re-election and removal of those directors by the general meeting. Report on proposals for the appointment of other directors to be appointed by co-option or for submission to decision by the general shareholders meeting, and proposals for re-election and removal of those directors by the general meeting. Report to the board on proposals for the appointment, re-election and removal of internal positions within the board of directors of the Company (chairperson, viceperson, lead coordinator, secretary and vice- secretary, if any). Report on proposals for the appointment and removal of senior managers and the basic conditions of their contracts. Report to the board on matters of gender diversity and, in particular, ensure that procedures for the selection of directors and senior managers do not suffer from an implicit bias preventing the selection of women. In particular, the committee shall set a target for representation on the board for the least represented gender, establishing guidelines to achieve this target. Analyze, formulate and periodically review the compensation policy applied to executive directors and the management team, including share compensation schemes and the application thereof, and guaranteeing that it is proportionate to the compensation paid to other directors and members of the management team and other personnel of the Company. Oversee compliance with the compensation policy set by the Company. Examine and organize the succession plan for the Company’s chairman of the board and the chief executive officer and, if applicable, suggest proposals to the board of directors to ensure a smooth and organised transition. Generally supervise compliance with the Company’s applicable corporate governance rules, including a periodical evaluation of the Company’s corporate governance system, such that it achieves its mission of promoting social interest and to takes into account, as appropriate, the legitimate interests of other stakeholders. Assist the board in the preparation of the report on directors’ compensation policy and send the board any other reports on compensation contemplated in this regulation, verifying the information on compensation paid to directors and senior management contained in the different corporate documents, including the annual report on directors’ remuneration. The members of the nominating and compensation Committee are Mariano Martín Mampaso, chairperson, and Antonio Urcelay Alonso and Angela Spindler as members. Diego Cavestany de Dalmases: Executive Manager Operations DIA Spain. Antonio Coto Gutiérrez: Director Executive Manager for Latin America and Partnerships. Juan Cubillo Jordán de Urríes: Business and Merchandise Executive Director. Javier La Calle Villalón: Chief Services Officer and Executive of China. Amando Sánchez Falcón: Chief Services Officer and Executive of Portugal. DIA Group is managed by a team with extensive experience in the retail sector and an average tenure in the Group of more than 20 years. The DIA Group is a company involved in the distribution of food, household, and beauty and health products, specialised in the management of proximity stores. The company has a presence in five countries: Spain, Portugal, Brazil, Argentina, and China, and operates more than 7,700 stores with various formats including DIA Market, DIA Maxi, Clarel, La Plaza de DIA, DIA Fresh, Max Descuento, Cada DIA, City DIA, Minipreço and Mais Perto. All of these stores are managed either directly or through a franchise model. The company is listed on the Madrid Stock Exchange, and is part of the Ibex 35, the reference index of the Spanish stock market. Segment 1, Iberia, includes Spain, Portugal and Switzerland (DWT, ICDC). Spain and Portugal are the oldest countries of the Group and serve as a model for the other countries. They have a very high level of profitability and are very similar. The DWT companies are located in Switzerland, and provide services to the suppliers of DIA Group companies and ICDC, who jointly purchase merchandise with Casino. Segment 2, Emerging Countries, includes Brazil, Argentina and China. These countries are characterized by their significant expansion potential. In 2016, the DIA Group began operating in Paraguay following the signing of a master franchise agreement with a local partner. The project is currently in its initial stages, with only two stores open. Management monitors the operating results of its business units separately in order to make decisions about resource allocation and performance assessment. As a result of the new Code of Good Conduct set up by the National Securities Commission in Spain and approved in 2015, since then DIA has been working on adapting and publishing its corporate policies. The first stage, implemented in December 2015, involved the approval by the Board of Directors of a new Corporate Social Responsibility policy that is at the core of all the company’s actions and includes the principles included voluntarily by DIA in relation to its various stakeholders. The Corporate Social Responsibility Policy is set up as the reference framework prior to developing the other policies that the company has in connection with its relations with its stakeholders. On 11 December 2015, DIA’s Board of Directors approved its Shareholder Communication Policy, Fiscal Policy, Risk Management Policy, Media Relations in the Information Environment Policy, and its Environmental Policy. In 2016, the policies relating to Franchise Relations and the Corporate Food Quality and Safety policies were approved and published, as were the Crime Prevention and Anticorruption Policy, all of which are available on the company’s corporate website. At the time of publication of this report, the two remaining policies had been approved and published: the Human Resources policy and the Client Relations policy. To gauge the application of each of the policies and ensure that the CNMV’s Recommendations of the Code of Good Governance are complied with, the DIA Group has developed a series of indicators that are reported to the Audit Committee of the Board of Directors, which is responsible for the company’s Social Responsibility. All of these policies are available on DIA’s corporate website www.diacorporate.com, where they can be referred to.